Spotlight on Graciela Huinao submitted by Donna Hilbert. Graciela Huinao will be reading at the Long Beach Poetry Festival next Saturday the 12th of October. She will be reading in her native language (possibly others as well) and Margaret Towner will be translating. Margaret Towner also wrote the following portion of this spotlight on Graciela for your reading pleasure. Because of the discrimination and prejudice Graciela’s father suffered as a child in school, he did not teach her the language of their people, fearing that the same thing would happen to his daughter. As a result, she grew up speaking Spanish, the language that was imposed historically on the Mapuche communities by the conquistadores. Graciela was one of the only members of her family to finish junior high school, where only Spanish was allowed to be spoken. Later, as an adult determined to overcome these barriers, she learned Mapudungun, realizing the importance and strength of a people’s language as an act of survival. Graciela spent her early years in Walinto “happy and free,” following the footsteps of her father into the countryside and the fields around them, where he guided her in learning their spiritual beliefs, rooted in the natural world and informing her Mapuche-Williche cultural practices. Her poems speak of her childhood and of the ancestral stories her family shared around the central fire in the ruka, their Mapuche home. That rolled up in my father’s soul. Graciela’s poems also tell her personal story, that of a contemporary Mapuche woman who left her home to work as an “asesora de hogar,” a housekeeping consultant, a glamorized title for domestic work in Santiago, Chile, in order to send money back home to help her family. Graciela has lived through many challenges in addition to leaving her family to work in the capital. 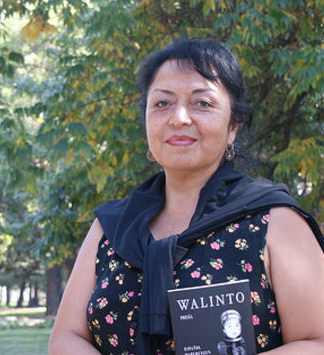 Teachers accused her of plagiarism and disregarded her because they did not believe that a Mapuche student could write. Her mother died while she was just a young child, and later her father died while she was still in her early twenties. Perhaps given her own age, her father’s death affected her profoundly, for he was not only a companion and friend but also the storyteller as he shared his deep love, knowledge, and appreciation of their culture with her. Because I know you up close. You have the broken face of sadness. Tore us in our poverty. La loika was the first poem that Graciela published. The loika, a long-tailed meadowlark of the disappearing natural habitats of Southern Chile, is a metaphor for the losses she feels her family and her people have faced for generations. For what was mine yesterday. And because loikas one day will be lost-. Today the severe decline in the number of people who speak Mapudungun is rapidly accelerating. Mapudungun faces a similar fate as other indigenous languages- extinction! In this context the importance of Graciela’s trilingual text and recording is most significant and timely. Graciela seeks to give voice to her people, through both Spanish and Mapudungun, and to share their stories with the world through English! The wisdom and tragedies of her ancestors’ lives, as Graciela tells them through poetry, become a universal story and all too recognizable as history continues to repeat itself. With the disappearance of a culture’s language, the beliefs, cultural nuances, diversity of customs, integrity, and survival of a people are completely challenged. It is at this intersection that Graciela makes her greatest contribution to the preservation of her language and culture—by leaving her own literary accounts, vision, and understanding of her culture in both written and spoken form. She leaves not only her own legacy but also the legacy of a people in their own words, with the assurance that they will forever be counted. Pingback: Los Angeles CA. Octubre 2013.